Price is per two of these large amber beads - each measures about 50mm x 39mm 10mm. Hole to thread drilled all the way through top-to-bottom.Amber has been called “petrified sunlight” or “frozen gold”. Its bright yellow conceals the mystery of the gem, producing jewelry that makes the wearer both look good and feel good. No wonder it is so fashionable in the 21st century. Amber jewelry can create an effect that no diamond can ever do. 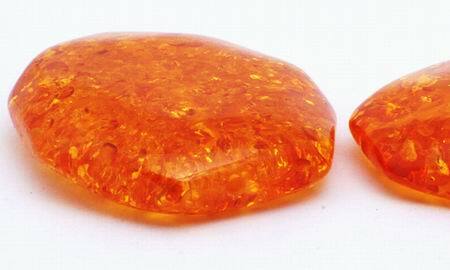 Our amber, like most today, is ambroid amber - an affordable, immature variety of copal amber mixed with synthetic resin.